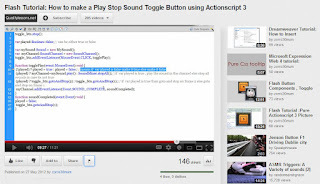 I was looking for interesting Flash/Actionscript videos on YouTube when I came across a video uploaded on the 27/5/12 (7 days ago) called "How to make a Play Stop Sound Toggle Button using Actionscript 3". The YouTube user is called zorro30mum. I thought to myself, the code in the video looks very familiar. I looked back at some of my older posts and discovered zorro30mum has essentially plagiarised the code from my: Toggle sound button in Actionscript 3 tutorial. 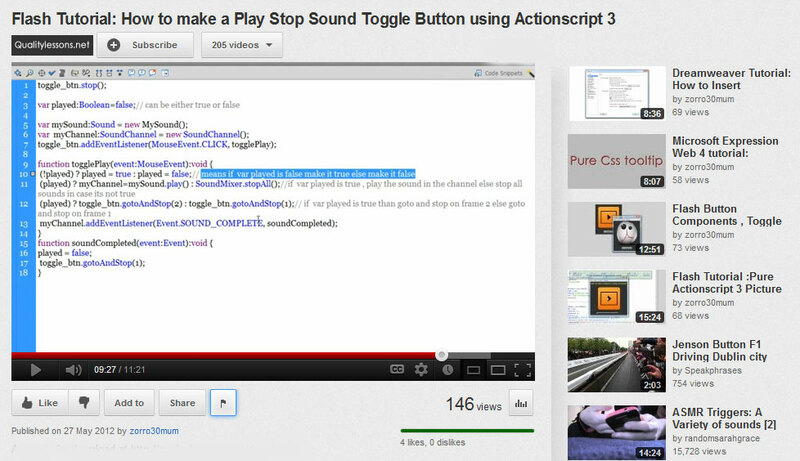 I left a comment on the video stating the plagiarised code. However, this comment was promptly removed by zorro30mum confirming this guilt and fact that he did intentional copy my content. I have of course notified Google of the copyright offense so action should be taken shortly. I am certain the video I seen is not an isolated incident and believe zorro30mum has also plagiarised code from my other posts as well as code from other people. zorro30mum stop plagiarizing people’s content. Don’t be a copy cat. Be an original!